All the elements of the ultimate New York City living experience in one sumptuous residence at The Greenwich Lane. A luminous corner condominium facing east, west and south offering 4 bedrooms, 4.5 baths and a balcony, with 3,951 of interior square feet, configured generously to provide the most desired layout. 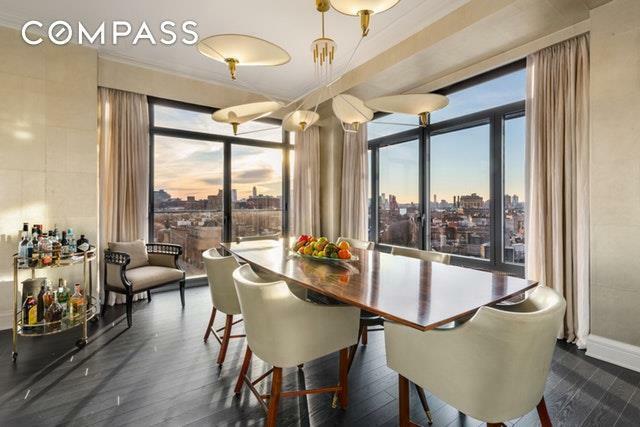 From the 9th floor, the three open exposures and floor-to-ceiling windows display a panorama of dazzling views of the Hudson River, Downtown Manhattan and vast landmarked areas, including Greenwich Village churches. Juliet balconies with a wall of windows open up completely and creating a delightful indoor/outdoor sensation. The Greenwich Lane - the amenities packed condominium complex - is situated in the heart of the West Village, NYCs most intimate and coveted residential neighborhood. The upper A line units, including 9A, are considered the most sought after apartments at the Greenwich Lane. 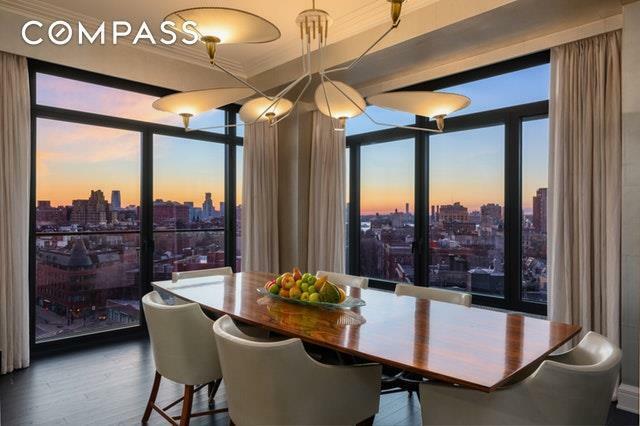 There is truly no comparable property to be had in the West Village.Direct elevator access opens to a private entry foyer and entrance gallery at the center of the residence. The gallery leads to a massive south-facing great room and flows to separate wings on both sides. The great room (3811X1811) is comprised of a living room with two social areas and a corner formal dining area with Hudson River views. 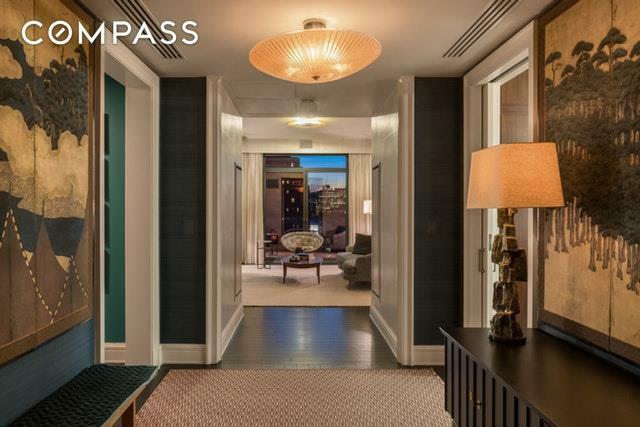 Completed in 2016 - with interior finishes by Thomas O'Brien of Aero Studios - the home is fitted with superbly crafted details such as rich oak hardwood floors in dark-stained coating, lavish marble counters and baths and custom millwork. Interior design by the Kureck Jones team combines high end, refined elegance with the practical comforts of home. Owners installed improvements such as Lutron automated lighting throughout, as well as automated window coverings in the form of draperies, sheers and privacy shades. There is also a Sonos sound system throughout. The sum of inspired aesthetic choices resulted in a magical warm ambiance.The spacious chefs kitchen, with a family room/eat-in area, has custom-paneled walnut cabinetry, a sizable center island, and veined grey marble countertops and backsplash. The kitchen is equipped with separate Sub-Zero refrigerator and freezer, Wolf and Miele appliances, a wine cooler and features Waterworks Aero Retro fittings in polished nickel finish. The owners installed HAFELE pullouts and additional shelves.The corner Master suite features floor-to-ceiling glass windows with southern and eastern exposures, a large walk-in-closet/dressing room with custom TCS closets, and a resplendent master bathroom arrayed in white and grey marble on the walls, flooring, and surrounding the tub. The master bathroom is appointed with a fine custom millwork vanity, marble floor with mosaic detailing, glass-enclosed shower, and radiant heated floors.All bedrooms have en-suite bathrooms with fine marble details and custom closets. The 4th bedroom suite, facing east and south, is currently used as an office/guest room with a custom murphy bed and multiple closets, including one with an additional wine refrigerator. Other home amenities include a powder room, a laundry room with LG washer and fully-vented dryer, and four-pipe HVAC system with zoned climate control for maximum year-round flexibility. There is also a dedicated service entrance/mudroom. The Greenwich Lane is LEED-certified, designed by architects FXFOWLE. 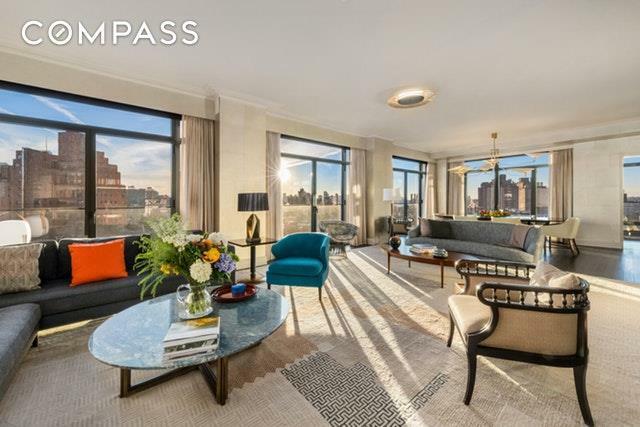 This level of services and amenities have never been offered in any other building in downtown Manhattan. A central courtyard with a reflecting pool designed by M. Paul Friedberg & Partners connects all of the buildings. Amenities include 24-hour concierge and maintenance services, valet parking garage, state-of-the-art fitness center, 25-meter swimming pool, hot tub, steam room, yoga and treatment rooms, golf simulator, residents lounge, dining room with guest chefs kitchen and separate catering kitchen, 21-seat screening room, children's playroom, bicycle and private storage.